When it comes to the NCAA basketball tournament the only sure bet is Go To Team. Yeah, your bracket might be busted if you write in GTT instead of Ohio State or Kansas but at least you’ll walk away with some stellar video footage. Charleston based DP, Dave Baker and myself (Roggg Woodruff) made the trip down to New Orleans for Intersport. 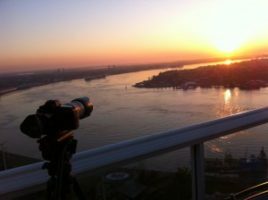 There's nothing like starting the day with a 5D and a sunrise. 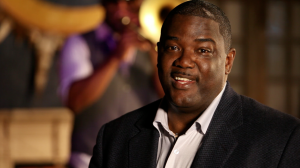 With two HDX 900s and a Canon 5D at hand, we spent the day in New Orleans shooting an Enterprise Rental Car vignette with former NBA star, Joe Dumars.The day started just before sunrise. The producer and I made it to the top of a downtown hotel building and captured the sun rising over the great Mississippi River. Afterwards I captured a few more b-roll shots with the 5D before heading to the local Enterprise Rental Car facility. It was there that I met up with Dave and together we started to set up for the first of three location shoots with basketball legend, Joe Dumars. The first set up was outside with Mr. Dumars and a couple of Enterprise employees. We used one of the 900s as a wide safety shot while the other 900 got cut aways. The 5D, with a 70-200mm lens attached, was used to get a close up shot of Mr. Dumars. Afterwards we packed up and made our way to a jazz club. It was there that Joe and a few Enterprise employees enjoyed some jazz music. Once again, we used three cameras to cover the scene. Our day was scheduled very tightly so we had to take advantage of three cameras. Using two HDX 900s and a 5D allowed us to do fewer takes but still get all that was needed. Close up of Joe Dumars at Blue Nile. Mmmm shallow depth of field, yum. Our final location was at a restaurant that’s been around for over a hundred years called Commander’s Palace. 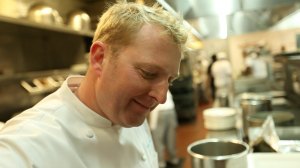 Joe and the Enterprise employees hung out in the kitchen at the chef’s table. Space was limited so we used one 900 to get a wide shot and the 5D to get a close up of the chef and Mr. Dumar. It was already pretty well lit in there so we just candy striped a 400w Diva to give the shot a little punch. We finished just in time for Joe to catch his flight. Afterwards I shot some kitchen b-roll with the 5D and a 16-35mm lens. 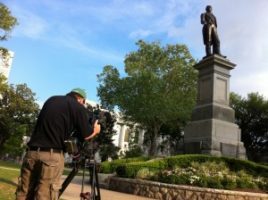 Dave gets his "time-lapse" on in Lafayette Square. With a few hours of daylight left, Dave and I split up and headed out to get some more b-roll of New Orleans. We then met up at the hotel and handed the tapes over to our producer. In the end it was an action packed day, and that’s exactly how we like it. With the tapes out of our hands and batteries on charge the only thing left to do was grab an adult beverage on Bourbon St. and enjoy the city of New Orleans.